Noted for his contributions to the fields of automatic text translation, information retrieval, and automatic question answering, Nyberg holds a Ph.D. from Carnegie Mellon University (1992) and a B.A. from Boston University (1983). 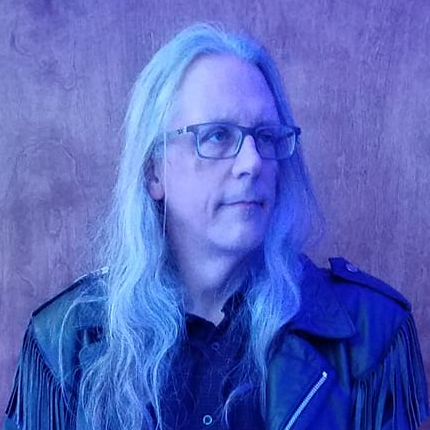 He is a recipient of the Allen Newell Award for Research Excellence (for his contributions to the field of question answering and his work as an original developer on the Watson project) and the BU Computer Science Distinguished Alumna/Alumnus Award. Eric currently directs the Master of Computational Data Science (MCDS) program. He is also co-Founder and Chief Data Scientist at Cognistx, and serves on the Scientific Advisory Board for Fairhair.ai. The ACAI Project. Today's AI practitioner must explore a very large space of data, features and models in order to find an acceptable solution, with inherent limitations on time and computing resources. In January 2018, CMU began collaborating with Meltwater  to develop principled engineering of cloud-based AI systems, using Meltwater's Fairhair.ai platform . ACAI (Accelerated Cloud for AI) will provide storage, virtualization and scalable service-oriented pipelines for efficient data preprocessing, feature extraction, dataset creation, model training, and model evaluation, along with built-in performance monitoring and scaling of component services. The framework will be applied to benchmarking tasks in Named Entity Recognition (NER) by MCDS students completing their Capstone project in Fall 2018. ACAI is also being applied to the creation of new challenges and solutions in Automatic Question Answering. 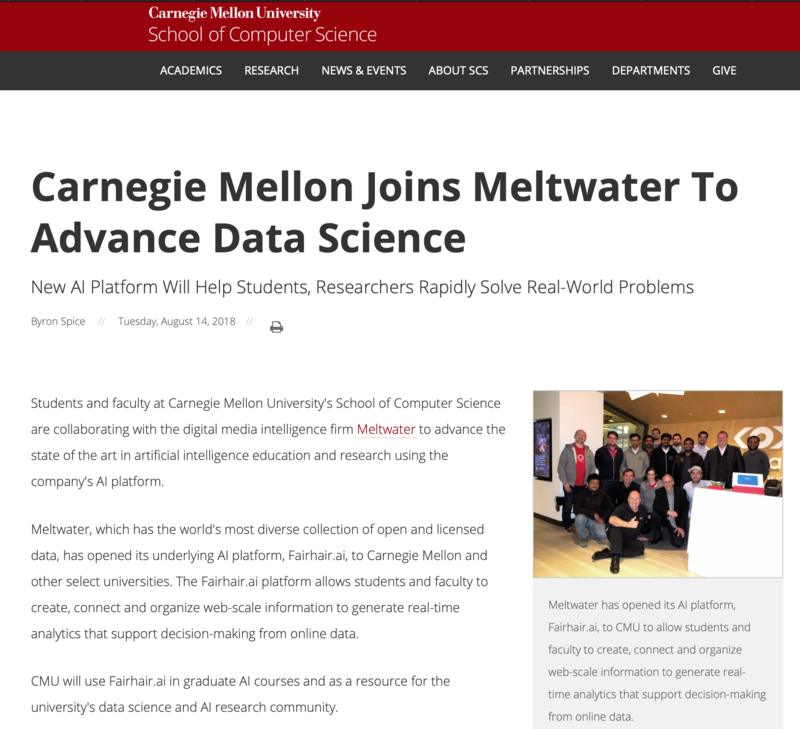 "Carnegie Mellon Joins Meltwater to Advance Data Science: New AI Platform Will Help Students, Researchers Rapidly Solve Real-World Problems", from www.cs.cmu.edu on August 14, 2018. "Meltwater launches data science platform Fairhair.ai to tame real-time market signals found in world's online data", from www.meltwater.com on August 14, 2018. The BioASQ Challenge. From 2012 to 2016, a team led by LTI Ph.D. student Zi Yang collaborated with Hoffman-LaRoche's Innovation Center to develop information systems for unstructured biomedical text, including a passage retrieval system for the TREC Genomics dataset , a decision support system for gene targeting which leverages information gathered from PubMed articles by an automatic QA system , a Biomedical Semantic QA system which received six 1st-place scores in the 2015 BioASQ Challenge tasks, which included snippet retrieval, concept retrieval, and exact answer retrieval , and a Biomedical Semantic QA system which received three 1st-place scores in exact answer retrieval in the 2016 BioASQ Challenge . 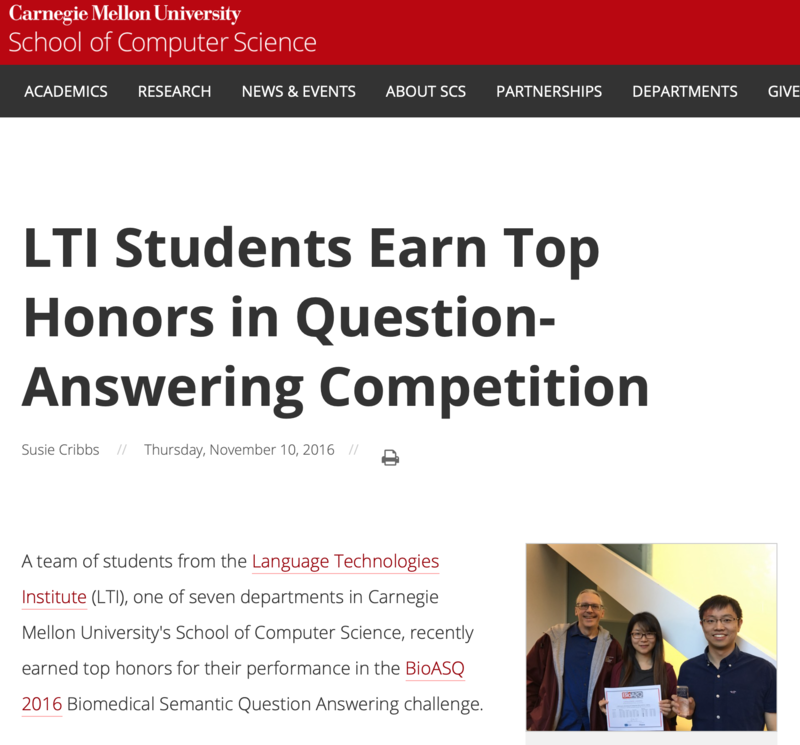 In 2017, a team of CMU Ph.D and MS students focused on ideal answer (summary) questions in BioASQ, and received the best automatic evaluation score in Task 5B . The LiveQA Challenge. From 2015 to 2018, CMU collaborated with Yahoo! Labs (as part of the InMind project) to develop automatic answering agents that can respond to real-time questions from web users (like those received by the Yahoo! Answers community QA web site). 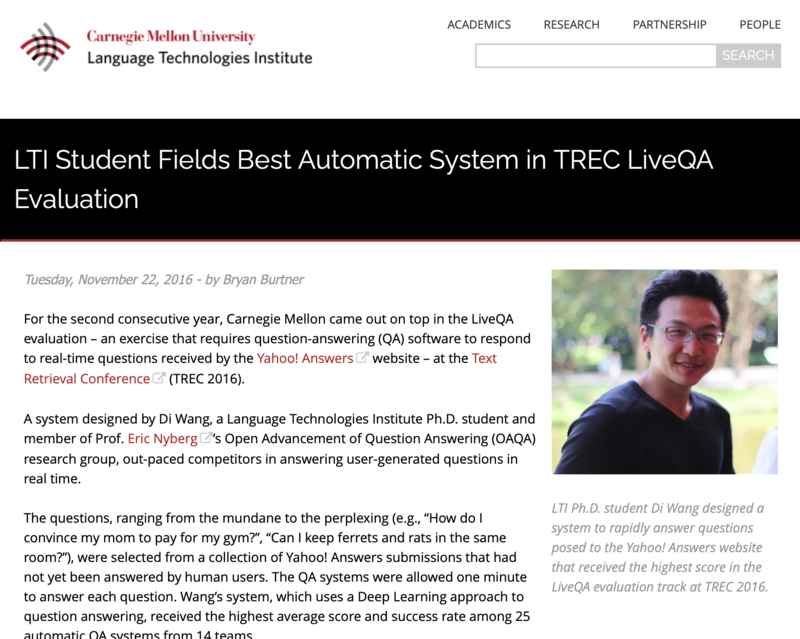 CMU student Di Wang created a LiveQA system which combined standard retrieval algorithms (BM25) with state-of-the-art deep learning models  to achieve the highest score among all participants in the 2015 TREC LiveQA Challenge . In 2016, Di extended his system to include a novel answer ranking method based on attentional encoder-decoder recurrent neural networks  and achieved the highest score among 25 automatic systems that were evaluated in the 2016 LiveQA Track . Di continued to refine his approach and fielded the best automatic system for LiveQA medical questions in 2017 [5,6]. D. Wang and E. Nyberg (2017). "CMU OAQA at TREC 2017 LiveQA: A Neural Dual Entailment Approach for Question Paraphrase Identification", Proceedings of TREC 2017 [ PDF ]. The Jeopardy! Challenge. From 2007 to 2011, CMU collaborated with the IBM DeepQA Group to develop an open-source framework for open advancement of question answering (OAQA) . The initial OAQA architecture and data model were used to build systems for the TREC challenge problem and the Jeopardy! challenge problem [2,3,4,5]. 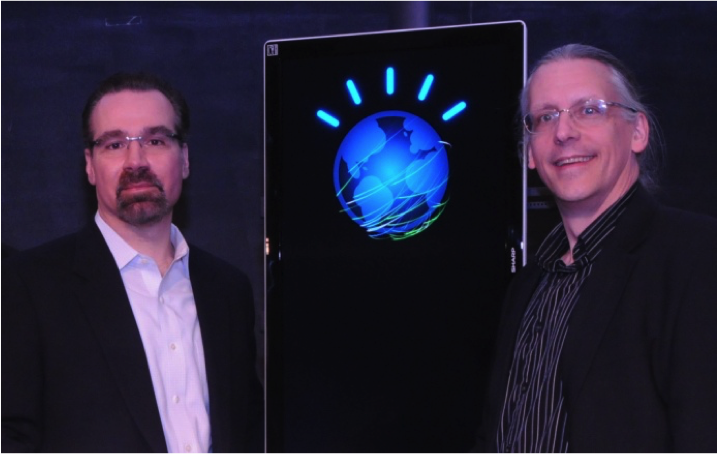 Carnegie Mellon students Nico Schlaefer and Hideki Shima also contributed algorithms and code to IBM's Watson system, as participants in IBM's summer internship program.